This took a lot of patience to finally get into my hands. It kept going on backorder every time I had the extra ten bucks to treat myself to it. 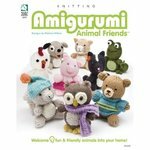 Finally the planets aligned, and six weeks after I pressed the "submit" button, I have Amigurimi: Animal Friends in my possession. There are nine critters to knit in here, and being new to knitting toys I like that they're all ranked "easy". I started with the little chicken, since I had all of the yarn colors readily available in Knit Picks Palette, even though it was the sweet owl on the cover that originally won me over. The book recommends US size 6 (4mm) needles for all of the projects. No swapping needle sizes in the middle of things, so it goes very quickly. In just an hour and half I had the head done, except for the eyes. I haven't knit on straight needles for a long time, so that was an adjustment, and I know it slowed me down. I'm going to eventually purchase myself either shorter straight needles, or more likely round out my supply of DPNs and just use a point protector at one end to make a suitably short needle to work with. My wrists will thank me later. Click to enlargeOne thing I will do on the next project is try working with two strands of yarn at once, or go down at least one needle size. Since I made this just for decoration, I don't anticipate any issue with stuffing coming out between the stitches, but if I were to make this to give to a kid, I'd want a much tighter fabric. I don't think this would hold up under play very well as is, but that could also be the result of my knitting gauge. (I almost never swatch. Shh! Don't tell the universe!) Plus at seven inches tall for the critters, they're a little big for just decoration. I'd like to see how far down I can go in needle size (and potentially down to lace weight yarn held double) and still get a cute critter, without hurling colorful curses towards the heavens for not being able to just leave well enough alone. 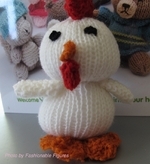 I think even beginners to knitting would be able to produce a cute critter in a short amount of time. There's no knitting in the round. There are some uses of short rows, but the instructions are easy to follow. You have to cast on in the middle of the row to create toes ad tails, but that just takes some practice to get the hang of. It's basically creating your own little tiny pieces of fabric, then sewing up the seam, and then sewing that piece into place. If you've sewn toys before, like I have, it's mostly intuitive. The pictures are huge, so you have a great guideline to help you make sure you're putting beaks, waddles, wings, and eyes in the right spot. More pics posted in my Gallery!